One of the great advantages of digital cameras is that you can look at the image right after taking the picture. You can zoom in on your photograph to see if your subject is sharp where you want it to be sharp. If parts of your image are overexposed so that they do not have detail in your preview screen, those parts of your image will blink black & white (I admit it: I call this the "blinkies"). You can know ahead of time if you have exposure problems with your image. If you are shooting in RAW, you still might have detail in those parts of the photograph, but don't count on it--take the picture again if you can. The left side of the histogram represents the darker parts of your image, and the right side represents the lighter parts of your image. The red, blue and green parts of the graph show you how each of the three main color components are exposed. Now earlier we defined "proper exposure" as the exposure that gets you the results you want. I'm going to assume for the sake of this post that you want detail in the highlights and the shadows of your image. As we've seen in another post, this is not always possible, but when it is, the histogram will tell you if you've achieved that goal. Notice in the above histogram, the graph tapers off to the bottom (zero) on the left and right hand side of the graph. This means that there are no parts of your image that are either overexposed and underexposed. You may or may not have the exposure exactly the way you want, but since you have detail throughout your image, you know you can make adjustments in your computer to get the results you want. 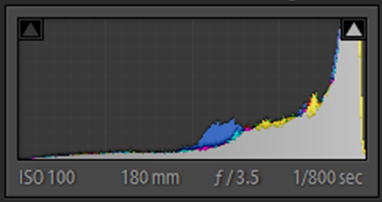 Now let's look at a couple other histograms you may see when shooting outdoors. In the histogram to the right, you'll notice that the graph is pushed against the left hand side, and the graph hits the left hand side of the graph above zero. This means that some parts of your image are so dark that you've likely lost detail in the shadows. Your image is likely underexposed. Now you may be taking a picture of a very dark scene, so this may actually reflect the scene as it was, and it may be the exposure you want. But by checking your histogram, you will know what your exposure looks like. If you want detail in the darker parts of your image you will need to reshoot the photograph with a higher exposure. Now this next histogram is quite different. Notice the graph is pushed against the right hand side, and and the graph hits the right hand side above zero. This means that parts of your image are so bright that you've lost detail in the highlights. Your image is likely overexposed. 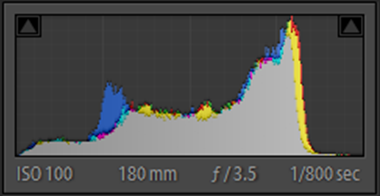 Now again, this may be what you want, but if you want detail in the bright parts of the image, this histogram is telling you that you should probably reshoot the photograph with a lower exposure. This is not all you can tell from the histogram. Look above at the histogram for the "properly exposed" image. Notice that the graph is very wide, taking up almost the entire width from left to right. This tells you that you're shooting a high contrast scene. If the histogram was very narrow, it would indicate that you have just photographed a very low contrast scene. Notice also in the "properly exposed" histogram above that there's a spike in exposure toward the right side of the graph. this means that there's a concentration of exposure values in the image that are relatively bright. So you can check your preview screen. Is there a relatively bright part in your image, and do you want it to be bright like that? If not, then you probably want to reshoot, even though the histogram shows you that you have a good exposure. So now let's make a distinction for the sake of this post. We'll distinguish between a "good" exposure and "proper" exposure. Proper exposure is the exposure that gives you the results you want. 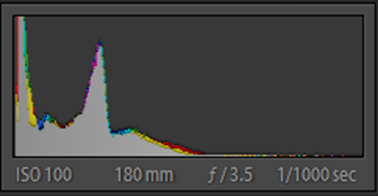 A good exposure is the exposure that gives you most possible pixels inside the histogram. To say that another way, "good exposure" is one that gives you the most detail throughout your image. The two may be the same, but sometimes they are different exposures. When they are different, I often prefer to get a "good" exposure, even when that differs from the one that I want. Here's why: you can do a lot more with the "good exposure" on your computer. You can easily change it to be the "proper" exposure in most any image editing software program. But if you shoot the exposure you want and lose detail in the highlights or shadows in that exposure, you can't get that detail back later if you decide to do something else with your image. So when you're in the field consider two things. Have a vision for the image you want and shoot for that image (get your proper exposure), but also consider what exposure will let you do the most with your image (get a good exposure). If those two goals require two different exposures, I will shoot at least two images, one for each exposure. If I only have time for one, I'll usually opt for the "good" over the "proper." 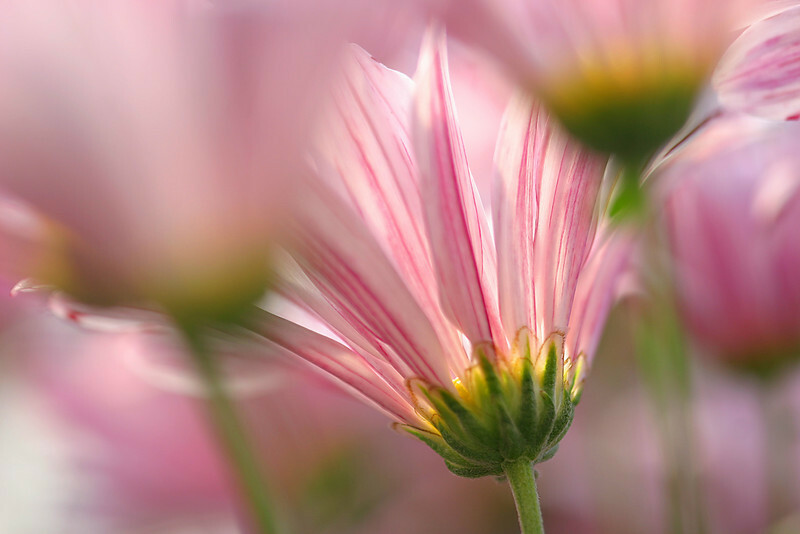 The above image is of a group of flowers at Brookside Gardens. Notice that while there is detail throughout the scene, much of the image is near white. What do you think the histogram should look like for this photograph?